The RTTY Contest Forum was held at 12-1pm Saturday, 18 May, 2013 in Room 3 of Hara Arena at the Dayton Hamvention. 180 people attended, standing room only. 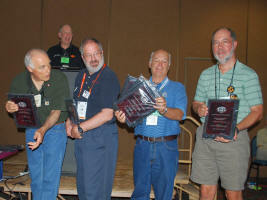 This forum overlaps the Contest Forum which is popular with most of the RTTY Contest Forum attendees. In fact, 172 of the 180 attendees voted that they'd like the two forums spread apart so they could attend both. Only 8 people said they didn't care about the schedule conflict. Larry, Mark and Mark all did an outstanding job of presenting a lot of material very effectively in an amazingly short time. Everyone stayed on schedule and the questions ran out during Q&A just one minute before the hour expired. During the Q&A, VK4UC suggested that the Dayton RTTY Dinner be started up again and his idea was met with much enthusiastic support. Fred WW4LL volunteered afterward to help pull that together. He and Ed W0YK are looking into alternatives.